Imagine a computer, complete with processor chip and sensors, so small it could give a grain of salt a run for its money. 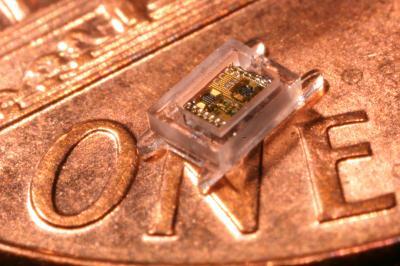 Now imagine embedding it inside your body as a super-smart sensor capable of transmitting data to your doctor. Imagine a computer, complete with processor chip and sensors, so small it could give a grain of salt a run for its money. Now imagine embedding it as a super-smart sensor inside your body. The device in question is designed to be embedded into the eyeballs of severe glaucoma sufferers, where it sits quietly tracking intra-ocular pressure, before reporting its data wirelessly to a sensor wand held near the patient’s eye. It could transform numerous people’s lives, potentially helping them manage their disease and dodge blindness–and it’s so promising it’s expected to be available on the market inside just a few years. But despite this neat application, which has very tangible benefits, the actual success of the technology here is breathtaking. This development from the University of Michigan is believed to be the first “millimeter scale computing system,” because in one extraordinarily tiny device, there’s a CPU, battery, memory, sensors, and the necessary electronics to power the chip, wake it up to take measurements, and to transmit the information over radio. It gets its power from sunlight (handy in the in-eye application) and needs just 1.5 hours of sunlight exposure, or 10 hours of indoor lights, to keep it functioning every day. The one drawback is that there’s not much room in the chip to give it power to transmit and receive data from a duplicate chip–that typically requires some sophisticated timing and encoding/decoding circuitry, as well as excellent antenna design. This is something a different research team at Michigan has tackled, and they’ve refined a similar millimeter-sized device that has an integrated antenna, and can manage its timing circuitry well enough to enable chip-to-chip wireless networking (despite forgoing the accurate, but bulky, external crystal oscillator that other larger systems use). This development offers an almost endless list of potential medical applications (a body full of networked, chattering sensors that collaborate to work out if something’s going wrong with you–that would make Fantastic Voyage seem trivial), imagine the potential for scattering these chips through important structures like buildings or aircraft–to measure and manage stress loading in real time. Or how about a super sophisticated surveillance grid? Or a crowd-sourced networking to solve computational tasks, or measure pollution if these tiny computers were embedded in our cellphones or shoes…?